We here at The Red Hut Inn provide quite and comfortable room for the reasonable price. We are situated only 8 miles away from the airport, and in an up scale and quiet residential neighborhood! We are only few houses away from the sea, and the environment is very safe. There is a large supermarket and restaurants in walking distance. We have a nice sun deck for recreation purposes. A kitchen is also available for guests to use. We provide pick up and drop off service and laundry service. (Fees apply). Dorm room comes with AC, TV, its shared hot n cold bath, first come first serve, gets you a bed space on bunk. We look forward to seeing you at The Red Hut Inn. Please Note: Taxes not included in rates shown online. Check in time as follows between 3pm to 7 pm. If any check in after 7 pm is needed, please let us know in advance by email, otherwise you may risk waiting for a little while to be check in, since we are not aware you will be checking in after 7pm. We only stopped here quickly overnight for less than 12 hours but the impression that we got was very good! super friendly staff, happy to help organise anything we needed. Only slight thought was that it was a little expensive for what it was but not that bad! Great place to stay while you’re in the city. Wouldn’t recommend staying in Belize city but if you are this is a great spot. Lois is great, he has all the tips and is awesome to talk to. Even shares his run for you to have a taste. Friendly staff. Accommodations clean and comfortable. Close to airport. You could catch public out front and take to airport entrance. About a mile walk from there. If yo prefer RHI has a shuttle for $20. Red Hut Inn was way better than I expected. Lewis was so friendly, & was able to provide rides for us! The deck is amazing, and not only did our room have its own bathroom, but we also have air conditioning & a fridge. Belize city isn’t the best location in Belize, but this hostel was above and beyond. We were even able to buy home cooked dinner that was DELICIOUS! The only thing that I would warn against is the 14 day cancellation policy, which is very strict. Would definitely recommend. I really enjoyd my stay. The staff were very friendly and helpful. They serve breakfast and dinner. I only had the dinner which I liked. 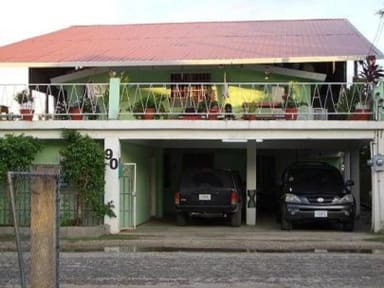 They also have laundry service and can offer rides to various places in Belize City. The internet worked fine. I didn’t like that there was no way to lock up my stuff, although I didn’t feel that I needed too. The location is far from the bus stop but if you could call ahead I’m willing to bet someone would pick you up from the hostel. The dog across the street barked a lot and I felt like we were overcharged a bit for the airport shuttle and shuttle to the water taxi. It’s a ways from “downtown” Belize city but safe a peaceful. They also charge for breakfast. The Red Hut Inn had a relaxed atmosphere, spacious rooms and a nice common area/ balcony. We did however have issue with the facilities in the sense that the cost of laundry, bottled water and charge to use your card was very high. There was water provided but it is tap water which did not suit us. Just stopped in for one night, overall had a good experience. But there were no lock/key for the rooms. No lockers in the dorms as well which made it a little nerve wracking in terms of security. The lady was friendly and very helpful though. The kitchen was small and not equipped with much, but the terrace space was lovely! Good place, generally speaking. The room was not what I booked and after much back and forth the host made an accommodation. Not a great travel experience. The location is away from everything. The place was clean and the breakfast was great. Other than the room mixup it was all good. 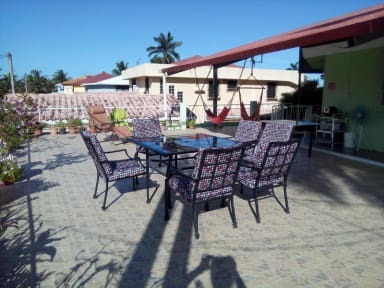 Good location to leave Belize but not recommended to stay more then one night. Few bugs in the room but it is in Central America. Seemed safe and semi close returants and a close corner store. For what they charge is debatable but over all a decent last place to stay before leaving.